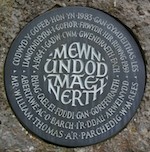 Dai Tomos interviews local individuals to recall the events of 1963 and how it shaped their lives within the community. Thank you to Telesgop for creating an excellent production which looks back at the history and events of 1963 as well as looking forward into the future. Children from Ysgol Y Fro singing in the thanksgiving service as part of an S4C Dechrau Canu, Dechrau Canmol brodcast. Llangyndeyrn Church 27th October 2013. Dechrau Canu, Dechrau Canmol is a Welsh language spiritual and church music programme, which has been broadcast consistently since 1961. http://www.s4c.co.uk/dechraucanu/e_index.php? The battle to save a community from a watery grave Fifty years have passed since a small agricultural community in Carmarthenshire won an epic battle to save their land from becoming a reservoir to supply water for Swansea. 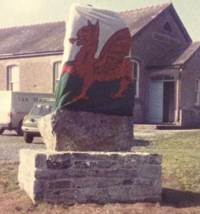 The S4C documentary Brwydr Llangyndeyrn (The Llangyndeyrn Battle) on Sunday, 20 October tells the story of how Cwm Gwendraeth Fach was saved in 1963 by meeting the families of the people who were at the heart of the battle.